Thanks to your incredible efforts during the appeal – organising Big Brews, cycling huge distances and giving self-sacrificially – we raised £548,530 to support hidden entrepreneurs in developing countries. The great news is that this amazing effort has been doubled by the UK Government to make a final total of £1,097,060 (figure does not include gift aid total). In Meru county, Kenya, over 60% of people are illiterate, 50% are in debt and 44% can’t regularly provide enough food to properly feed their families. But women farmers there are keen to use the power of entrepreneurship to change the future for their families. They just need some support to get going. We’ll be helping them form groups with like-minded peers and providing training on vital business skills. But the really exciting thing is not so much the collectives that are formed, or the training that takes place… it’s what happens next. By working together and supporting each other, these women will have a stronger voice in negotiations with buyers and suppliers enabling them to increase their household income and improve working conditions. Thanks to your support, thousands of hidden entrepreneurs in Meru county, Kenya – and all over the world – can at last use their skills, their determination, their enthusiasm to build businesses that feed families and send children to school. That’s what your support has done – it is changing the world one entrepreneur at a time. 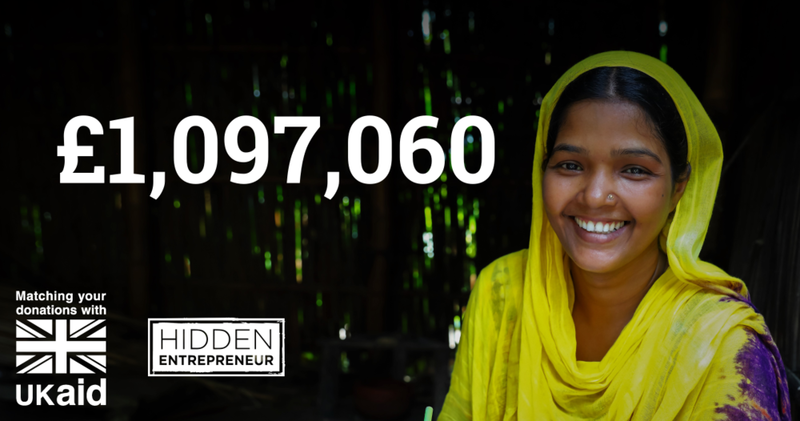 We can’t wait to share with you all the inspiring stories that come from the Hidden Entrepreneur appeal. But for now, we just want to say a huge thank you. Your efforts are making the world a better, fairer place.